As one of the world's most remote scuba destinations, divers can avoid the crowds in Madagascar's Indian Ocean and enjoy pristine seascape and unusual marine life. Liveaboards in Madagascar are opening up some of this island nation’s most spectacular dive sites. The island of Madagascar has been the place to go for wildlife and rainforest tours, a haven for eco-tourists. This appreciation for nature has also spread to the underwater world. Endemic marine life and a huge variety of sharks and corals have put Madagascar on the liveaboard diving map.The diving in Madagascar had, for many years, been focused around the Nosy B island region, thanks to the many passing whalesharks. Further out past the Nosy B area however, the outlying islands are home to even more abundant life and some of the best diving in Madagascar. Huge mantas, sharks and breeding grounds for whales in these regions, draw liveaboard divers to the more isolated spots. Remote and quiet, divers will find that Madagascar is fairly undiscovered as an underwater destination. This makes these islands the perfect spot to enjoy megafauna and beautiful reefs still relatively undisturbed. Dive cruises in Madagascar typically take groups to Nosy Be and either the Radames Archipelago or Mitsio Archipelago. These trips are usually on a laid-back catamaran style boat with plenty of time spent relaxing in quiet little bays between dives. Liveaboards in the Radames Archipelago often stop off on the islands offering guests the chance to take in the terrestrial wildlife as well. Lemurs and chameleons can be spotted along with huge baobab trees or stick to the beach and swim with turtles on Turtle Island. The diving varies a little between the islands with Mitsio a little more rocky and volcanic and Radames home to the quiet beaches and crystal clear bays. Both are great for spotting big pelagics like mantas, sharks as well as pelagic shoals. Nosy Be on the other hand is famous for the numerous whale sharks and sightings of the Omura’s Whale. Most liveaboard trips spend one week visiting either archipelago with two or three dives a day and the option of a land visit after. For divers looking to do two weeks scuba diving in Madagascar it is possible to do the two trips separately and take in both of these beautiful areas. Much of the scuba diving in Madagascar is centered around the island of Nosy B. This is the most developed area in terms of tourism and one of the best dive spots in Madagascar for whaleshark sightings. A little off the island’s coast there are the Manta and Shark Points as well as a cluster of four small wrecks. 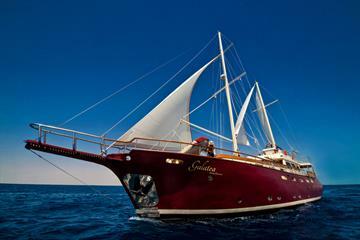 Lucky liveaboard divers might also spot passing humpbacks and pods of dolphin. Humpbacks come to Madagascar to give birth and it is not uncommon to see mother’s swimming with their calves off the coast of Nosy B. While the bustling island of Nosy B offers a wide variety of life and sites for liveaboard divers, the outlying islands couldn’t be more different. Tranquil and quite tiny these coral these tiny coral fringed islets are the best spots for sharks and turtles. Liveaboards in Madagascar can take divers south to the Radames Archipelago a large stretch of hard coral reef which remains relatively untouched. Mantas are also a common site in Radames stopping in at the reefs for cleaning. To the north lies the equally remote and stunning Mitsio Archipelago. These islands are particularly far from civilisation with only one inhabited island. Mitsio not only famous for its clear turquoise waters but also the fascinating array of underwater rock formations. The islands are volcanic and so steep walls, tunnels and reefs can be found all over the archipelago. These make great cleaning stations for mantas and sharks. Huge shoals of pelagic fish, paired with great visibility, make Mitsio the perfect place for underwater photography enthusiasts too. Although there is year round diving season in Madagascar, between May and December is generally the most popular time of year. In July and August when the weather is at its coolest and most temperate is the high season. Madagascar enjoys very warm waters especially in the North where the temperature is between 26°-29°, on the cooler end of this scale in the spring months. October to November is the best time to see whalesharks in Madagascar, they are passing around Nosy B and the surrounding islands frequently in this period. This region is also famous for the migration and birthing of humpback whales. Between July and October these huge creatures come to the east to have their calves before migrating through the archipelagos. It is not unusual to spot them breaching from dive cruises in Madagascar. The people in Madagascar are very proud of their beautiful island and most speak Malagasy the local language as well as French. Learning a few words in Malagasy is a great idea and is bound to impress the local people when you stop off for a visit on the more remote islands. The currency in Madagascar is ariary which is used for most transactions. However, prices can be in Euros for very expensive items and hotels and occasionally Euros will be accepted for these kinds of payments. Be sure to bring spares for anything you can live without. In Nosy B and other larger islands there are many dive centers and shops but in the remote archipelagos you are not likely to find much other than souvenirs and food on sale. Be sure to bring European style plug adaptors for charging equipment on-board as well. Flights to Antananarivo the airport on Madagascar are frequent from several major European cities such as Dublin, Paris, London and Frankfurt. There are also flights from Istanbul in Turkey and from mainland Africa. Johannesburg has around six flights a week in addition to one weekly flight from Nairobi. However, in Madagascar liveaboards normally depart from the island of Nosy B. Air Madagascar provides flights directly to Nosy Be from Paris and Nairobi as well as from the mainland. It is worth noting that private taxi and car hire are the best ways to get around in Madagascar. 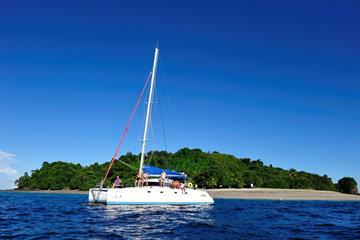 Liveaboard divers will find mostly luxury liveaboards in Madagascar with small groups and personalised service. The prices for dives and liveaboard stays are mid-range although flights are on the higher side. Divers will find that courses on-board are very reasonable and Madagascar is a fantastic place for all levels of dive training. Visas are required for all nationalities visiting Madagascar and can be bought upon arrival. These visas are relatively inexpensive, around 27 dollars and payable in ariary, the local currency. You can stay for up to 60 days on a normal visa, longer stays require a special visa. Be sure to have a passport that is valid for at least six months when you arrive.